The laidback, welcoming atmosphere of Margaritaville is coming to Gatlinburg, Tennessee. Margaritaburg, LLC, a consortium of local investors, will build Margaritaville Resort in the Smokies at 539 Parkway in Gatlinburg. Developer and restaurateur Bob McManus serves as president of Margaritaburg LLC, affiliates of which own and operate The Island in Pigeon Forge, including the Margaritaville Hotel in Pigeon Forge. Among the investors is Gatlinburg businessman and hotelier Alex Davis, owner of D&S Builders, LLC, who will serve as contractor for the resort. “On the heels of the devastating wildfires, the announcement of this project shows the strength of the tourism industry in Gatlinburg, and we believe Margaritaville Resort in the Smokies will play a key role in rebuilding the community’s economic health,” McManus said. Margaritaville Resort in the Smokies will be self-contained on approximately 5 acres, a natural island formed by the Pigeon River flowing through the Smoky Mountains, where Best Western Twin Islands currently is located. 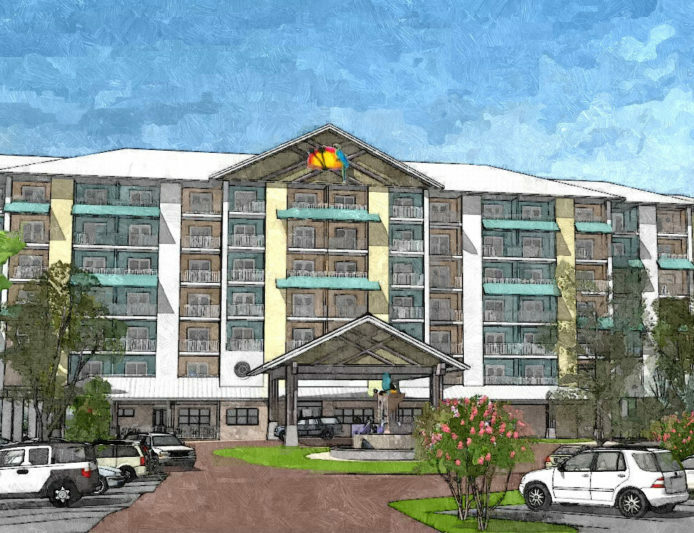 The resort will include a seven-story, 174-room hotel, signature Margaritaville food and beverage concepts, a 4,000-square-foot outdoor pool with a large two-loop slide and splash pad area for kids, hot tub, indoor heated pool, St. Somewhere Spa, shops and other amenities. In addition to the on-site restaurant, a LandShark restaurant will be built at the former Hard Rock Café site on the Parkway. Guests at the Margaritaville Resort in the Smokies will have direct walking access to the restaurant. Margaritaburg, LLC, estimates the project as a $35 million investment in Gatlinburg that will generate 150 jobs between the resort and adjacent restaurant. Demolition of the Best Western began Dec. 13, and construction will start in the first quarter of 2017. The LandShark restaurant is expected to open in spring 2017, and Margaritaville Resort in the Smokies is slated to open in July 2018. The lead architects are Jay De Foe and Tom Trotter with Trotter & Associates Architects, LLC. Rooms in the hotel will feature a stacked stone fireplace, private balcony and wet bar stocked with a Margaritaville Frozen Concoction Maker. In addition to the room amenities, the hotel will offer a fitness facility, room service, concierge, bellhops and valet parking, and guests will be welcomed to the property by a one-of-a-kind parrot-themed fountain. The resort location is next to Ripley’s Aquarium of the Smokies and within walking distance of many Gatlinburg shops and attractions. “Inspired by the lyrics and lifestyle of singer/songwriter Jimmy Buffett, Margaritaville Resort in the Smokies will be the perfect setting to escape the everyday and ‘just chill’ in the picturesque mountains of East Tennessee,” McManus said.